Global change and human expansion have resulted in many species extinctions worldwide, but the geographic variation and determinants of extinction risk in particular guilds still remain little explored. Here, we quantified insular extinctions of frugivorous vertebrates (including birds, mammals and reptiles) across 74 tropical and subtropical oceanic islands within 20 archipelagos worldwide and investigated extinction in relation to island characteristics (island area, isolation, elevation and climate) and species’ functional traits (body mass, diet and ability to fly). Out of the 74 islands, 33 islands (45%) have records of frugivore extinctions, with one third (mean: 34%, range: 2–100%) of the pre-extinction frugivore community being lost. Geographic areas with more than 50% loss of pre-extinction species richness include islands in the Pacific (within Hawaii, Cook Islands and Tonga Islands) and the Indian Ocean (Mascarenes, Seychelles). The proportion of species richness lost from original pre-extinction communities is highest on small and isolated islands, increases with island elevation, but is unrelated to temperature or precipitation. Large and flightless species had higher extinction probability than small or volant species. Across islands with extinction events, a pronounced downsizing of the frugivore community is observed, with a strong extinction-driven reduction of mean body mass (mean: 37%, range: -18–100%) and maximum body mass (mean: 51%, range: 0–100%). 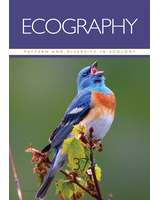 The results document a substantial trophic downgrading of frugivore communities on oceanic islands worldwide, with a non-random pattern in relation to geography, island characteristics and species’ functional traits. This implies severe consequences for ecosystem processes that depend on mutualistic plant-animal interactions, including ecosystem dynamics that result from the dispersal of large-seeded plants by large-bodied frugivores. We suggest that targeted conservation and rewilding efforts on islands are needed to halt the defaunation of large and non-volant seed dispersers and to restore frugivore communities and key ecological interactions.